We have developed PRM3.0, an improved version of the PRM (Plant Resource Manager) unified device management software package for various field resources. Since PRM was released in 2001, the industry has gone through some major changes in circumstances surrounding PRM, with increasing prevalence of field networks, improvements in device diagnostic technologies and a change in the way asset management is regarded. There are now great demands for improvements in the Plant Asset Management (PAM) process, in order to optimize plant conditions while minimizing cost. In response, Yokogawa Electric proposed the Asset Excellence (AE) solution, consisting of PRM, FieldMate, and other asset management solutions. PRM has been enhanced with revolutionary improvements, allowing it to function as a long-term platform for PAM. This paper describes the requirements in PAM, and the PRM features that satisfy these requirements. Process automation involves both operation and maintenance. Plant operation and monitoring are mainly conducted by a control system such as CENTUM, while equipment maintenance is handled by Plant Asset Management (PAM)1 such as Plant Resource Manager (PRM). Operation and monitoring deal with the present and near- future conditions based on signals from a variety of sensors installed in a plant, control status information, history information, and so forth; the role of PAM is to consistently maintain and manage the resources such as equipment and devices making up the plant in an appropriate condition for a long time. Since the process automation facilities of even a small plant may use several thousand devices of several hundred types from more than 10 manufacturers, PAM is required to maintain and manage these devices for 10 years or more at reasonable costs. However, maintenance is often supported by the experience and intuition of maintenance staff. The appearance of bi-directional digital fieldbuses, smart devices (or intelligentiziing of devices), and development of diagnostic techniques have enabled the resources of a plant to be managed online in the same manner as operations. We have upgraded PRM as a platform for maintaining and managing plant resources over their life cycle. 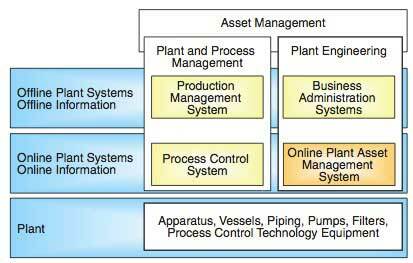 Figure 1 shows the relationship between operations and maintenance in NAMUR NE912 "Requirements for Online Plant Asset Management Systems" in terms of facility management. Conventional facility management is similar to asset management and does not necessarily enable devices to be procured quickly or repaired and adjusted easily, as the field side desires. However, the bi-directional fieldbus enables plant assets to be managed online. FOUNDATION™ Fieldbus devices can notify self-diagnostic results as events on a voluntary basis, and PRM 2.0 incorporates the presence/absence of an event as a device status. Moreover, as devices have become more intelligent, device setting and adjustment have been implemented. The FDT/DTM technology, which is the international standardization of FDT/ DTM (Field Device Tool/Device Type Manager)3 interface through which device manufacturers can conceal their know- how, has created DTM as a design tool for devices as well as providing setting and adjustment tools for devices not dependent on the network protocol. Being compatible with FDT/DTM, PRM R3.0 enables devices to be set and adjusted using a protocol other than FOUNDATION fieldbus and HART. PRM R3.0 has enhanced the diagnostic function and linkage with diagnostic technologies. It offers advanced diagnostic functions as options. These functions not only monitor the results of self-diagnoses by equipment or devices, but also acquires the results of other manufacturers' diagnostic packages and in-device statuses not directly used for operations at a certain timing, combines them with historical data or other information to predict or estimate the statuses, and displays the results as the device statuses in PRM. 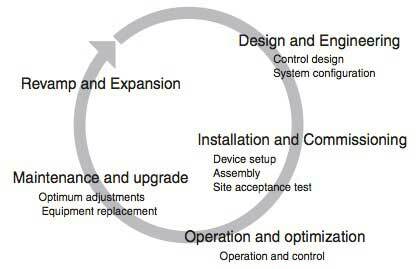 Figure 2 shows the life cycle of devices. The initial PRM was generally used as a tool for setting devices in the installation phase. However, by providing support for expanded diagnostic functions and FDT/DTM, PRM is now useful also in the operation and maintenance phases. In the design and engineering phases, a linkage with an engineering tool such as CENTUM enables PRM to handle devices throughout their life cycles, and thus PRM provides a platform for plant asset management solutions. PRM R3.0 manages device status and history to control information centering on the device registry. If work for a device is required, PRM R3.0 provides functions such as adjustments and diagnosis. Figure 3 shows the configuration of the PRM R3.0 software. The resources comprising a plant include devices such as transmitters and valves to equipment and facilities such as heat exchangers and distillation towers. PRM R3.0's device registry enables registration of the physical constituents of electrical and instrumentation components, devices (rotating machines and stationary devices), equipment, and facilities of a plant, etc., to which a unique ID can be assigned as products. 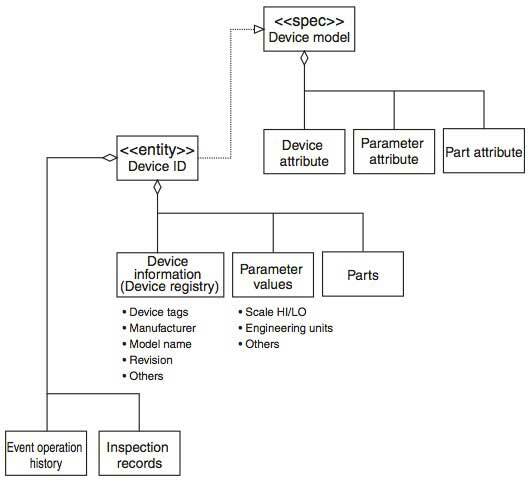 For equipment and devices to be registered in the device registry (PRM R3.0 does not distinguish plant resources including equipment and facilities), registry management can be conducted in compliance with the physical models of international standards such as ISA 88.01 Batch Control System Part 1: Models and Terminology using unique IDs (device IDs) as keys. Moreover, as accessories of devices, parts can also be registered. The PRM R3.0 program consists of three functional layers. The data layer consists of the database which manages device attributes and device statuses and events centering on the device registry and the communication server in charge of communication with devices. This layer must stably operate for a long time. The business logic layer handles judgment of device conditions from device statuses and events, distribution of mails and events by filtering device events, and diagnostic processing based on device parameters and events, etc. This layer has engineering elements such as setting the management indexes of equipment and devices. The presentation layer provides a user interface such as a display along with the hierarchical structure of a plant, group configuration matching with operations, etc. It is affected by the usage environment, which makes the revision period of products relatively short. The PRM R3.0, with its three-layer structure shown in Figure 3, is classified into the following four elements: PRM server, field communication server, advanced diagnosis, and PRM client, for ease of installing on a PC. There is a client-server relationship between elements. Each element can be located distributed on a network or arranged in the same PC, enabling a flexible system to be configured according to the number of devices to be managed and the business logic to be used. The center of the PRM constituents is the PRM server, the configuration of which is shown in Figure 4 (for the all-in-one type). The resource management database is built on a universal relational database, and at its periphery are the interface for acquiring information from devices and a device diagnostic system, the interface with the PRM client and MES/EAM (Manufacturing Execution System/Enterprise Asset Management) system, etc. 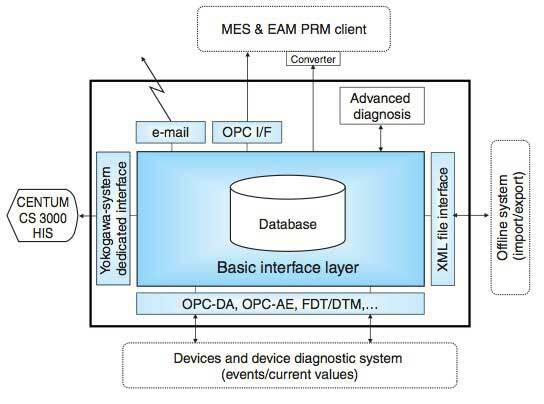 In particular, the interface with devices uses OPC or FDT/DTM, which are industry standards, to enhance interconnectivity and interoperability. These interfaces meet the objectives of applications, but in some cases conversion is required according to the system to be connected. In such cases, a basic interface through the converter is used to enable any system to be connected to the PRM server. Even if the system to be connected does not support the online function, an interface capable of exchanging information on an XML file basis is also available. Moreover, the PRM server also has the Yokogawa system-dedicated interface to transmit maintenance information to displays in CENTUM CS3000 HIS. 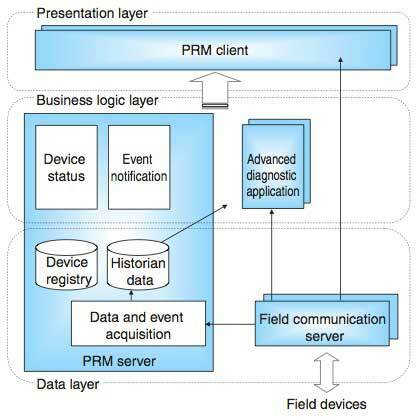 The business logic such as advanced diagnosis uses the basic interface in the PRM system (see the page describing "Unified Diagnoses Management of PRM Plant Resource Manager"). This section describes the database configuration. PRM has two types of databases: the "device registry" and the "device diagnostic data historian." The device registry manages static information and historical information related to the static information, while the device diagnostic data historian manages devices' dynamic data values in chronological order. Figure 5 outlines the configuration of the device registry database. PRM R3.0 manages "device models" which are the attribute information groups of the plant constituents to be managed and issues a "device ID" to the actual physical objects to substantiate their "device models." All management information such as events, operation history information, and device registry is managed by being linked to these "device IDs." The "device IDs" indicate physical objects and are designed to be traceable even if the device's attribute or management information is changed. A "device tag" set by the user is a label assigned to a physical object and is part of the information stored in the device registry. Because relationships are formed centering on "device IDs," management information such as events and operation history can be retrieved using a "device tag" as a key. "Device tags" are rather like installation location information. Therefore, even if a device tag different from the previous one is set because the installation location of a device has changed, the previous historical information is inherited. In contrast, although the device's installation location is the same, if the device is replaced, the past history will not be inherited because the physical object is different. Moreover, even if a deletion of device or operation is made on the PRM system, the actual device information is not deleted from the database, but the PRM system manages the device information by appending an attribute that the device information was deleted, making this information invisible in the PRM system. This design policy of the PRM R3.0 database ensures that all information is managed in a traceable way. On the other hand, the device diagnostic historian database automatically acquires and accumulates for a long period the acquisition target parameters that have been predefined on a device attribute basis. Simply selecting and setting the target device for acquisition in the PRM client enables the user to achieve fixed-point observation for identifying the device status, leaving data to be acquired and acquisition period to the field communication server. These acquired data are also managed in relation to the "device ID." Since accumulated data can be retrieved using a "device tag" as a key, they can be used for applications such as analysis of device status and studying new diagnostic algorithms. These two PRM R3.0 databases, the device registry and device diagnostic data historian, handle historical data and parameters respectively, and the amount of data grows over time. Therefore, they also have a function of automatically archiving data with time-series dynamic data as targets, to secure the integrity of each database. Along with the current PRM R3.0 upgrade, the database has been changed from Oracle 10G to MS SQL Server 2005 in order to integrate the device diagnostic data historian and simplify handling of the database system. Since this is a fundamental change to the core system, we conducted a thorough characteristic investigation and have built the database objects Figure 5 Configuration of Device Registry Database and basic interfaces to be optimized for MS SQL Server 2005. This has greatly improved the performance, even for large systems with several thousand devices to be managed. The various interfaces and database structure as described above make PRM a suitable platform for achieving various InsightSuiteAE functions and adding value to the service business in the future. Worldwide, engineers involved in plant design and operations in the 1970s and 1980s are starting to retire, and as a result, accumulated maintenance technologies are being lost. Thanks to improvements in device reliability and the proliferation of diagnostic technologies, device and equipment problems have decreased, resulting in quiet, boring plants. That is, plant operations have approached their ideal state. However, this means that there are fewer opportunities to encounter device failures or plant abnormalities, and to gain experience in maintenance technologies, as a result, it is getting more and more difficult for engineers to upgrade their maintenance expertise. The PRM solution enables information to be shared across time and space by storing device information for a long period. By configuring business logic in PRM, the technologies can be passed on to future generations. For details of the advanced diagnostic function using historical data, which could not be described in this paper due to space limitation, please refer to other pages in this technical bulletin. 'CENTUM,' 'PRM,' and 'InsightSuite' are registered trademarks of Yokogawa Electric Corporation. All other brand names, product names and title and copyrights used in this paper are either trademarks or registered trademarks of their respective holders.